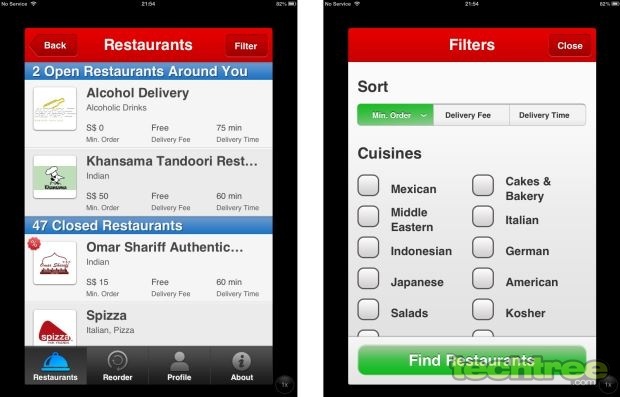 Now easily search for nearby restaurants and order food from your smartphone. Imagine you are stuck in an unknown place and are so hungry that you could eat a horse. Well, that won't be necessary with Foodpanda in your smartphone. This free app for Android and iOS devices can use your GPS to locate the restaurants closest to your present location or you can simply enter the PIN code to do the same. And that's not all, it even lets you order food right from the app. You can even filter the search results according to your choice of cuisine. Sounds interesting? The Foodpanda app is an extension of the browser-based online service and does everything that is possible through the browser. It currently catalogues over 1300 restaurants in varied locations across India such as Mumbai, Delhi, Bangalore, Gurgaon, Pune, Panchkula-Chandigarh-Mohali, Noida, Indirapuram-Ghaziabad, Faridabad, and Greater Noida with more locations being added regularly. To place an order, you simply have to select one of the restaurants that show up in the search list, browse the menu to select your meal for which price will also be mentioned, and place an order. A text message is then sent to your mobile regarding the status of delivery and you can pay for the order in cash once it is delivered. Additionally, you can save money by using the exclusive deals and vouchers provided by the developer.